*Please note that wherever DMP-30 is listed as the accelerator in our embedding media kits you have the option to use BDMA in place of it. BDMA is less viscous, has a longer shelf life, and offers better penetration (it should be noted, however, that in order to achieve the optimum results when using BDMA in place of DMP-30 you must vary the amount. DMP-30: 1.5-2%; BDMA: 2.5-3%). Luft's Formula. Polymerization takes place overnight so blocks can be sectioned the next day. J. Biochem. Biophy. Cytol. 9, 409 (1961). Also known as American Araldite. The blocks are slightly harder than those produced by Araldite 502. Mollenhauer Epon-Araldite Formula. For hard blocks and high image contrast. Blocks are easily sectioned. Stain Tech., 39,11 (1964). Three different mixtures: one for relatively soft blocks, another for harder blocks for collagenous tissue, and a tougher one, if required. A water soluble embedding medium for EM based on an aliphatic polyepoxide. A Fluka A.G., Buchs. Switzerland-Registered Trademark. An aromatic polyepoxide; a colorless resin of relatively low viscosity, with virtually no shrinkage. DGD is a removable embedding medium (for thin and thick sections) that provides embedment free sections. Good for immunolabeling and high resolution light microscopy. Thin or thick embedment free sections can be obtained. Sections are easy to cut and ribbons are easily obtainable. Enhances the integrity of the specimen as it floats on the water. Sections produce interference colors according to its thickness. Ethanol and n-butyl alcohol are used as dehydrating agents. Capco, Krockmalnic, & Penman (1984). A New Method of Preparing Embedment Free Sections For TEM: Applications to the Cytoskeletal Framework and Other 3D Networks. JCB Vol. 98, pp. 1878. Valdimarsson & Huebner (1989). DEGDS as an Embedding Medium for Immunofluorescence Microscopy. Biochem. Cell Biol. 67:242. Nickerson, Krockmalnic, He, & Penman (1990). Immunolocalization in Three Dimensions: Immunogold Staining of Cytoskeletal and Nuclear Matrix Proteins in Resinless Electron Microscopy Sections. PNAS Vol. 87, pp. 2259. Electron Microscopy Sciences' replacement for the discontinued Epon-812. Produces the same results in terms of preservation, handling, sectioning, and staining as the old Epon-812. Two versions are available. The #14120 kit includes DMP-30. The #14121 Kit includes BDMA in place of DMP-30. Mascorro, J.A. and Kirby, G.S. Novel Epoxy/Anhydride Alternatives for Biological Electron Microscopy: Physical and Performance Characteristics of EMbed 812 and LX 112 in combination with NSA/NMA/DMAE. Proc. 47th Ann. Meet. EMSA., pp. 1000-1001 (1989). Mascorro, J.A. and Kirby, G.S. Viscosity Characteristics and Hardening Rates for EMbed 812 and LX 112 with alternative Anhydride and Catalyst Choices. Proc. 49th Ann. Meet. EMSA. (1991). This mixture is less viscous than the final embedding mixture of EMbed-812. Epo-Fix is an old product that has existed only in the metallographic field until now. After extensive testing in our labs we have found that it is a perfect embedding media for a majority of material specimens. Until now, LR White has been the most commonly used embedding media for materials due to the block hardness it offered, but there are difficulties associated with LR White. For instance, the adherence to the specimen is poor and additives are required to improve its adherence. Another major problem is the inability to orient the specimen correctly in order to cut you block afterwards. This is due to the fact that LR White needs to be oxygen starved and gelatin capsules (vertical) are recommended by the manufacturer for use. Another problem is that polymerization time in the oven can take over 24 hours. Epo-Fix remedies all of these problems. It has very good sectioning properties, good adherence to the sample, very low viscosity, easy curing in molds (no orientation problems), and quick cure times. A two component epoxy resin, characterized by negligible shrinkage during curing and good mechanical properties in its hardened state. It is particularly suited for embedding hard samples of complicated shape and for vacuum impregnation. Samples such as paper, silicon, ceramics, metals, wafers, and chips are suitable to be used with Epo-Fix. It has low viscosity, low vapour pressure, good wetting properties, and minimal shrinkage. It hardens at room temperature without significant generation of heat in approximately 8 hours (no damage from heat or pressure), and at increased temperatures, 60°C, the hardening time is reduced to 2 hours. It should be noted that if you place Epo-Fix in a desiccator during curing you will eliminate any air bubbles. A water and lipid-retaining embedding polymer for EM. Excellent preservation of lipids and ultrastructure. Hechman, C.A. et al. (1973) J. Ultrastruct. Res. 42,156. J. Ultrastr. Res., 4, 196-99. Polyethylene Glycol - Glycol methacrylate mixture. A water miscible embedding medium for cytochemical studies and enzyme localization when light and electron microscopy need to be correlated. A newly formulated resin that enables the processing of specimens that have a tendency to wrinkle and be problematic. In general, Hard Plus Resin-812 and its WPE numbers (weight per epoxide) do not vary much from batch to batch and it also has good stability under the electron beam and it stains well with heavy metals. Furthermore, the viscosity of the Hard-Plus Resin-812 is lower than the original Epon-812, making infiltration of the tissue more complete. For processing and embedding, it can be used exactly the same way as Epon-812, but normally, it is not necessary to use intermediate solvents, such as propylene oxide, hence, infiltration can immediately follow with absolute alcohol. Polymerization is normally at 60°C for 24 – 48 hours. Longer times or higher temperatures (70°C or more) will give a harder block. 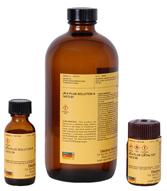 For larger samples (>1 x 1 mm3) the use of a intermediate solvent is recommended. Hard-Plus Resin-812 is supplied only as a premix kit. All components are pre-measured, and you have to do is combine them in the right order and mix thoroughly. Each kit contains five separate mini-kits, making approximately 100g each. HPMA is a water-soluble resin used for cytochemical applications. Infiltration follows fixation of the tissue so there is no extraction of materials caused by dehydration in alcohols. Leduc, E.H. et al., (1965) J. Cell Biol., 26:137. A water soluble embedding media which is based on Glycol Methacrylate (GMA) plastic embedding. It is intended for use in preparing samples for high resolution microscopes (HRLM). The catalyzed monomer acts as a dehydration and infiltration agent; therefore, complete dehydration through 100% ethanol is not necessary (although recommended for large or dense tissues). Conventional paraffin sections have a greater degree of shrinkage and produce inadequate morphology when compared to JB-4. Thin sections (.5-2.0 micron) with excellent morphological structure preservation. Water-clear blocks; casts in 90 minutes max. at room temp. Good lipid and enzyme retention when processing at low temperatures (4°C). Removal of JB-4 resin prior to staining is not necessary. 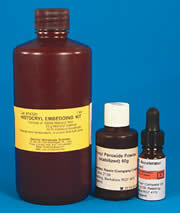 Clearing agents such as xylene and chloroform are not needed. Higher clarity and contrast than with paraffin sections. Easy processing of difficult specimens such as calcified bone and delicate embryonic tissue. It produces harder blocks which is ideal for dense samples, such as bone. JB-4 Plus offers all of the same features as JB-4 except it produces less of an exothermic reaction than JB-4 which is good for temperature sensitive tissues. The London Resin Company's acrylic "LR Gold" offers the histochemist and immunocytochemist the advantage of working with unfixed tissues at low temperatures, thus allowing many fixation-sensitive procedures to be carried out in 1-4 microns resin sections at -25°C using visible light. It is non-toxic and has a low viscosity. 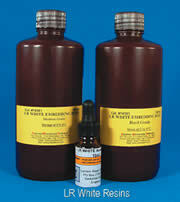 A very low viscosity (8cps), non-toxic resin, suitable for both Light and Electron Microscopy. LR White is a polar monomer polyhydroxylated acromatic acrylic resin. It can be cured by heat or by UV light. Sections of polymerized LR White resin are hydrophilic. This character allows immuno-cytochemistry reagents to easily penetrate into the sections and etching of the sections is not necessary (etching sections will effect delicate tissue antigens). LR White sections also show minimal non-specific staining. Its low viscosity makes it ideal for infiltrating decalcified bone and teeth as well as plant tissues. It is available in medium and hard grade. Histocryl acrylic resin has been specially formulated for light microscopy. It is water clear, and because it is hydrophilic (polar) it permits the use of most routine staining techniques without priorremoval or etching. Lowicryl resins are highly cross-linked acrylate-based embedding resins, designed for use over a wide range of embedding conditions. These resins provide low viscosity at low temperatures. The K4M kit is usable to -35°C and is a polar (hydrophilic) medium, while the HM20 kit can be used down to -70°C and is nonpolar (hydrophobic). Lowicryl's K11M and HM23 have properties similar to K4M and HM20, but can be used at temperatures 20 degrees lower than others: K11M at -60°C, HM23 at least -80°C. All of these resins are photopolymerized by long wavelength (360nm) ultraviolet light. Since the initiation of the polymerization is largely independent of temperatures, blocks may be polymerized at the same temperatures used for infiltration. The resin may also be chemically polymerized at 60°C. Hayat, M.A. (Ed.). (1989) Priciples and Techniques of Electron Microscopy, 3rd Edition. CRC Press,Inc. Boca Raton, Florida. Provides excellent penetration for embedding biological tissues and rapid infiltration. Easy to prepare. The hardness is adjusted by changing the proportion of the flexibilizer (DER 736). The blocks have good trimming and sectioning qualities. Thin sections are tough under the electron beam. Versatile! Easy to use! 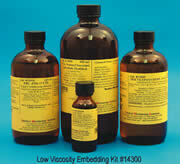 Save Time and Money with this one-step-preparation low viscosity embedding kit. It can be UV cured in the cold with the addition of benzoin methyl ether, or heat cured by the addition of benzoyl peroxide. The resin can be removed from the sections with a solvent (acetone) before staining. Micro-Bed resin is a newly developed water-soluble resin which is a mixture of acrylate and polyester resins. It is a very universal embedding medium and may be used for either light or electron microscopy. Due to its non-crosslinking characteristics, its hydrophilic nature, and roughness of its section surface, our Micro-Bed Resin is excellent in preserving tissue structure, offers good results in immunolabeling, and stands up well to conventional stains. In light microscopy, tissues were stained with conventional histological stains (e.g.,hematoxylin-eosin) and embedded in Micro-Bed: the results were comparable with those provided on paraffin embedded tissues. Further, polychrome silver-based and cytochemical stains (e.g.,PAS) were also feasible. In transmission electron microscopy, images as good as those obtained with similar acrylic resins, (e.g., Lowicryl K4M), were obtained. Micro-Bed is supplied as a single component-ready to use pre-mixed resin. Micro-Bed can be polymerized in either EMS embedding capsules or gelatin capsules by either heat(55-65°C) or UV (wavelength 365nm) light at low temperatures (-10 to 20°C) for 72 hours. A water miscible epoxy resin used for both light and electron microscopy. Its low viscosity permits easy infiltration and embedding, and yields light-colored blocks. Very low viscosity; monomeric styrene which penetrates rapidly into the tissues. It is soluble in ethanol and acetone. The infiltration and embedding can be done by styrene alone, and there is no need to dilute it with solvents. Polymerization can be done either by UV light (340-400nm) or heat (60°C) within 2-3 days without benzoyl peroxide added; 24 hours with 1% benzoyl peroxide added as a catalyst. Delamater et al., (1971) Pro. 29th Ann. Meet. EMSA, p. 488. Claitor's Pub. Div., Baton Rouge, La.